Melt the butter in a sauce pan or deep skillet over medium high heat. Stir in bananas and sugar, cooking until golden (don’t let bananas burn). Stir in cinnamon, nutmeg and cloves. Finally, stir in water only to cover surface, and let evaporate to form candy. Be sure not to burn the sugar, if so, it will acquire a sour taste. Serve cold with meat, rice or enjoy it alone. 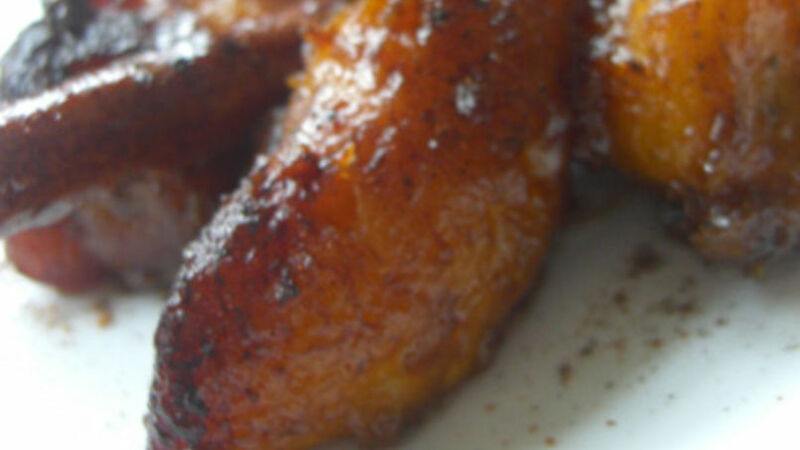 Sweet, ripe plantains are irresistible to the palate. Perhaps this is why many Latin American countries have not only one, but several dishes made with plantains. Whether fried, boiled, baked or in the otherwise prepared, they are delicious, and best of all, it they contain vitamins, iron, phosphorus, potassium and fiber. In the Dominican Republic and Cuba, sweet plantains are very much appreciated, and they garnish dishes with meat and rice. If plantains turn black or over ripe, do not throw them away. Take advantage of them to prepare this delicious recipe that will make more than one mouth water at your dinner table. Buen provecho!